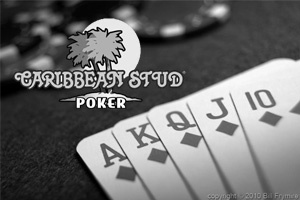 If you’re just learning how to play Caribbean Stud poker, arguably the most important tip you can get is that you’re playing against the dealer and the house, not other players. That means it is similar to blackjack in that way. Knowing this can definitely change the way you make some decisions because the dealer players with a specific regiment. In Texas Hold ‘Em, there’s bluffing, emotions and all sorts of other things that factor when you’re trying to evaluate other players. Playing against another player (or multiple players) will make you consider things in a different light than if you were playing against the house. However, remember, the other players are also playing against the house and what you do could affect them as well. Don’t be afraid to fold if you don’t think you can amass a better five-card hand than the dealer, which seems like it would be common sense, but again, some players think they’re just playing a game and not really thinking about the consequences. You’re only going to lose your money on the ante bet if you fold as opposed to going in and losing both wagers, so really consider if it’s worth it to play. You can always play another hand, but by going in on every hand, you won’t maximize your chances of winning. It’s an easy way to get bounced out of poker tournaments early.